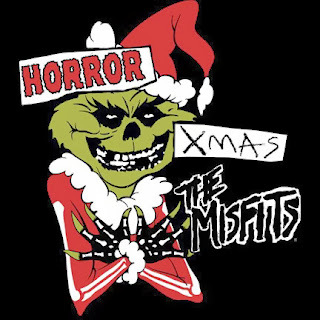 In the 1970s, rock bands started to write original Christmas songs instead of recording covers of classic Christmas songs. 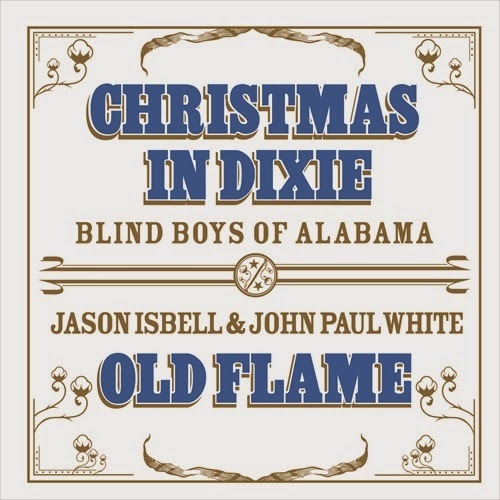 These songs would later turn into Christmas classic themselves. 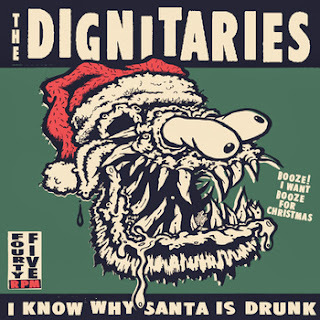 Everybody knows songs like Slade's 'Merry Xmas Everybody', 'Lonely This Christmas' by Mud or 'Wonderful Christmas Time' by Paul McCartney. One of the best of the original Christmas rock songs was released for Christmas 1977, the year punk broke. 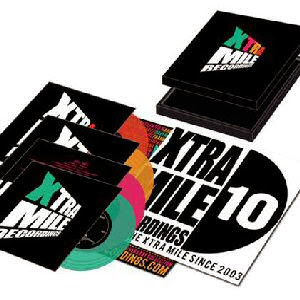 The band that recorded the song was not one of the many punk bands that had sprung up all over the UK, despite the fact that the song reflected the attitude and music of punk quite well. It was a band that was big in the sixties, and had been an inspiration, because of their raw guitar sound and their energetic and hectic live shows, for the many bands being started in garages all over the US in the second half of the 1960s, bands that in turn were an inspiration for the 1970s British punk bands. Most 1970s rock Christmas song were musically rock, but their message and lyrics did not really differ that much of the Christmas standards of the past – the songs were merry, expressing the joy and fun that Christmas is supposed to bring, or were full of melancholy, longing to be with loved ones or thinking about friends lost somewhere along the way. This song was different. It told the story of young kids who don't want Father Christmas to give them toys for Christmas, as they have no use for it – they needed money, or if not money, than at least a machine gun 'so they can scare all kids on the streets'. The lyrics were written by Ray Davies, singer / guitar player of The Kinks﻿, a song writer known for his ability to write striking observations of the social climate of the day. He did that in the sixties, in songs like 'A Well Respected Man', 'Mr. Pleasant', 'Dedicated Follower Of Fashion' and 'David Watts' (later brilliantly covered by The Jam, in a way The Kinks of the late 1970s). 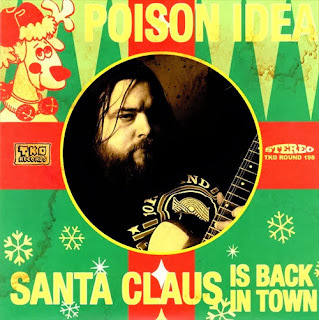 He had not lost his talent to write a biting social commentary by the mid-1970s, as the song 'Father Christmas' proves. 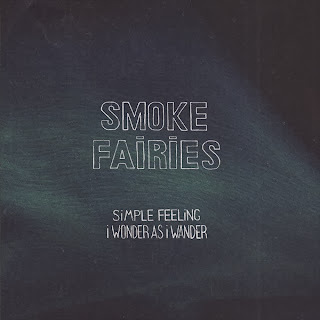 The band already started working on the song in 1976 while recording their 1977 album 'Sleepwalker' at Konk Studios in Hornsey, London, but did not complete it, and continued working on it when they recorded the follow up of 'Sleepwalker', 1978 album 'Misfits'. The song was finished in October 1977, just in time to have it released as a single late November 1977, not only in the UK, but also in other European countries like Germany and The Netherlands. 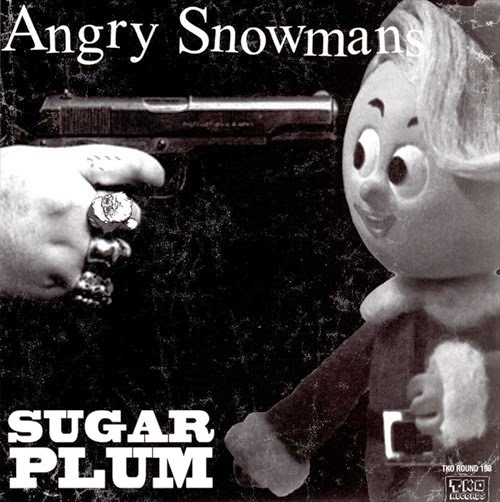 The song was uptempo and aggressive, despite the typical Christmas bells and other Christmas sounds. The story told is that of a young kid who believed in Santa Claus, although knowing that in fact his dad was Santa Claus, to keep his stockings being filled with presents. 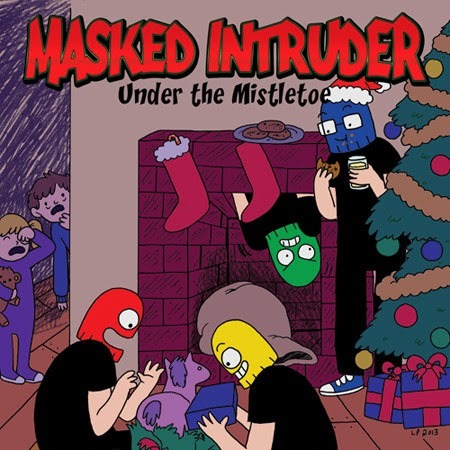 When he is grown up, he becomes a Father Christmas himself, but the kids he meets on the street are of a different kind than he was as a kid. They don't have any respect for Father Christmas, don't care about his presents, toys that they can't use and demand from him, violently (even knocking poor old Rudolph to the floor), the only thing they really need: money. He can keep the toys, to give those 'to the little rich boys'. And then the song takes a turn, because these boys may behave like little criminals, there is another side to it. They need the money as their father is without a job and can't feed his family. They need bread, to feed the hungry mouth of their little brothers and sisters. These boys are not nice (not at all, they want the machine gun to scare the other kids), but they are not only perpetrator, but also victim – victim of a world in which some people have so much that they can afford to give their children a Steve Austin outfit (aka the bionic man aka the six million dollar man), a cuddly toy, a jigsaw or monopoly money, while others can't even give their children bread. Then, in a break, we, the listeners, are addressed directly: 'have yourself a merry merry christmas, have yourself a good time, but remember the kids who got nothin', while you're drinkin' down your wine'. For those who still did not get the message of the song, this will definitely do the job. 1977 was not a nice year, and this was not a nice message, but if you really want to give Christmas some meaning, it's something you should not close your eyes to. You better try to do something about it, when you are lucky enough to buy toys for your kids, instead of not even able to buy them bread. 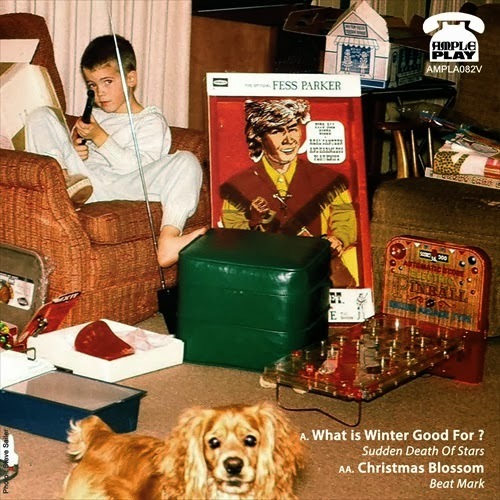 The B-side was not a Christmas song, but the title “Prince Of The Punks” sets also the scene for this song very firmly in 1977. 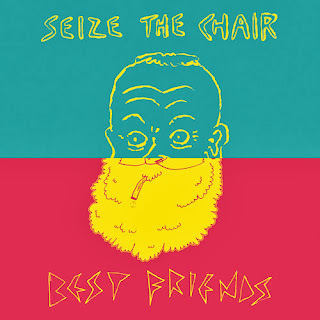 The UK version of the single came in cartoon style artwork, portraying the story told in the lyrics. 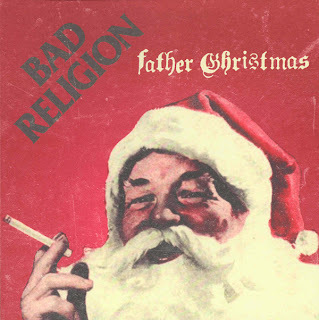 Despite the fact that 'Father Christmas' is now considered one of the classic Christmas rock songs, it did not chart in 1977 – not in the UK and not in the USA. The song has been covered several times, and it is no coincidence that the covers were mostly by punk bands or hard rock bands, like for example by Green Day, Warrant and Bowling For Soup, and, most recently, this year, Bad Religion﻿, who released their cover of 'Father Christmas' on a one sided 7” (on Epitaph Records) and The Old Firm Casuals﻿ who covered the song on their split Christmas 7” with Evil Conduct (on Randale Records). Bad Religion kept it simple, and recorded it with the basic band setup of guitar, bass and drums. 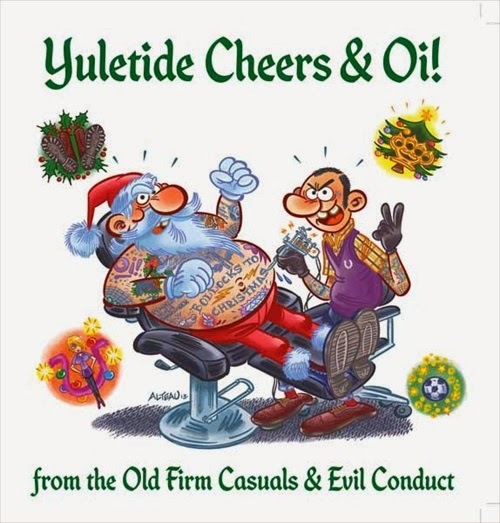 The Old Firm Casuals added piano and bells, and gave it a little bit more of a Christmas feeling. 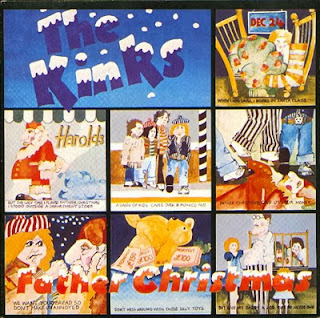 The original version of The Kinks stood the test of time very well, and still stands out as one of the best Christmas rock songs ever. Not surpringly so, knowing how many great songs The Kinks have recorded. Although Frank Sinatra was surely not the first to record 'Have Yourself A Merry Little Christmas', his version is probably the most famous version of the song. 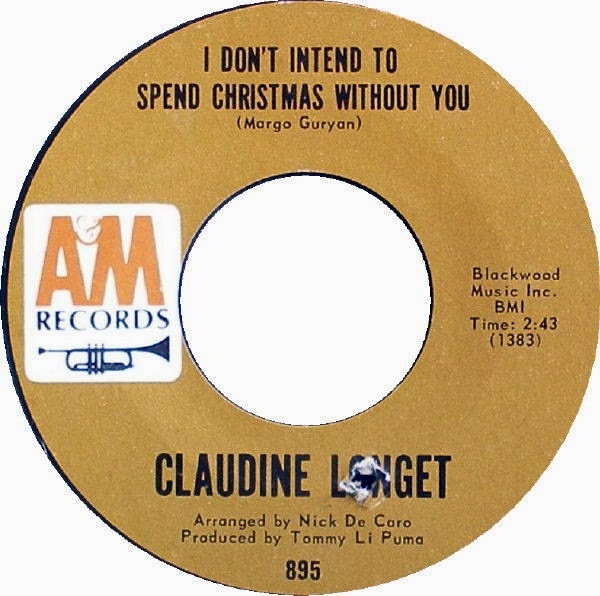 It has been released on several different 7”'s and EP's – the version I have chosen is the 1963 version released in the UK, and has 'I'll Be Home For Christmas' on the B-side. 'Have Yourself A Merry Little Christmas' was already almost 20 years old, when Frank Sinatra recorded it – not for the first time – for this single. The songs was first performed by Judy Garland, in 1944, in the MGM movie musical 'Meet Me In St. Louis'. Esther, the character played by Judy, sings the song to her little sister Tootie (played by a very young Margaret O'Brien) in a scene situated on Christmas Eve, to cheer her up, as the whole family is sad, because of having to leave their St. Louis, Missouri home for New York, where their father had found a new job. The song was written by Hugh Martin (lyrics) and Ralph Blane (music), although Hugh Martin later claimed he had also written all music of the 'Meet Me In St. Louis'-songs and that his naivity and lack of businessmenship made him share the credits with Ralph Blane. The music of the song has stayed the same through the years, but Martin has rewritten part of the lyrics several times. Judy Garland, who was supposed to sing the song in the movie, was the first who thought the original lyrics to be too depressing. 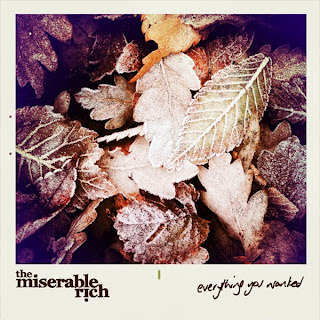 With lines like "Have yourself a merry little Christmas / It may be your last/ Next year we may all be living in the past” and “Faithful friends who were dear to us/Will be near to us no more'' it was indeed not exactly an optimistic song. In a way, it reflected the time it was written, a time when the US was deeply involved in World War II. Martin first refused to write the song, but after first director Vincente Minnelli (who claimed that his movie was about hope and dreams, so the song also had to have some hope in it) and later Judy's co-star Tom Drake, who was a friend of Hugh Martin, talked to him about, he gave in, and changed several parts of the song. For example, the lines "It may be your last / Next year we may all be living in the past" became "Let your heart be light / Next year all our troubles will be out of sight". Martin, who himself was a religious person, also changed the last part of the original line "through the years, we all will be together if the Lord allows" into "if the fates allow", to remove religious references and make the song a secular song. The changes turned the song from a song of sadness into a song of hope, hope for a brighter future. But it was still not a light song, because the final line of the song still reflected the sad situation of the moment: ''until then, we'll have to muddle through somehow.'' Judy Garland recorded 'Have Yourself A Merry Little Christmas' for a 78 rpm single on Decca Records, and it became especially with popular the US troups abroad, although it was certainly not the big hit from the movie. That was 'The Trolley Song', that got an Oscar nomination for best song of 1944. But this was not the end of the story for the song. When Frank Sinatra wanted to record the song for his 1957 album 'A Jolly Christmas' (he had recorded it before in 1947), he asked Martin to 'jolly up' the final line. Martin changed the line to "Hang a shining star upon the highest bough" and made several other changes. This changed the character of the song again, it was no longer a song expressing hope for a better future, but a celebration of present happiness. 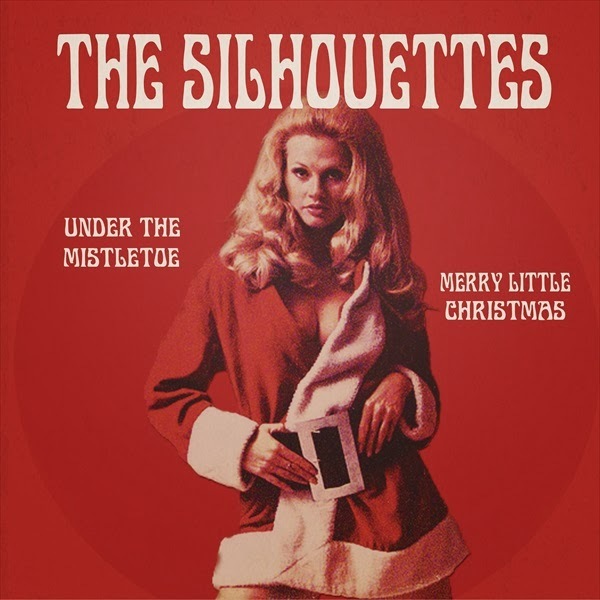 It is this version that hundreds of artists have recorded through the year, and also the version The Silhouettes have recorded for the flipside of their Christmas single. 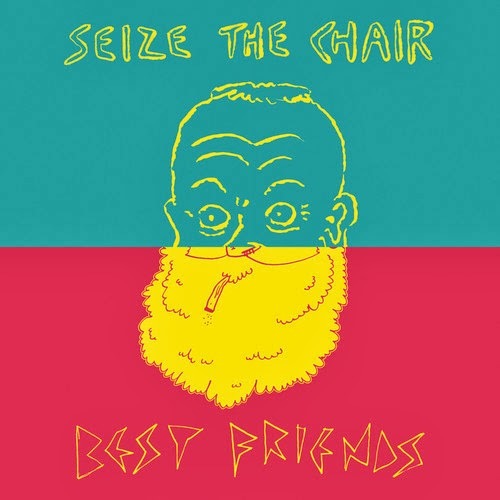 The original version had “Faithful friends who were dear to us / Will be near to us no more”. The Frank Sinatra version changed it again, now to “Faithful friends who are dear to us / Gather near to us once more”. Martin, who always continued writing songs, wrote a complete new set of lyrics to the song in 2001, when he was well into his 80s. 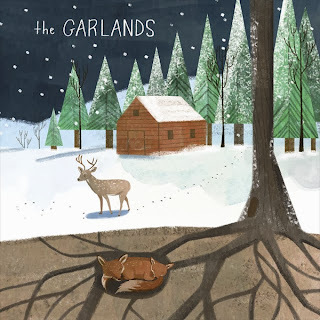 The new lyrics not only brought the original line "through the years, we all will be together if the Lord allows" back, but also turned the song in a completely religious song. 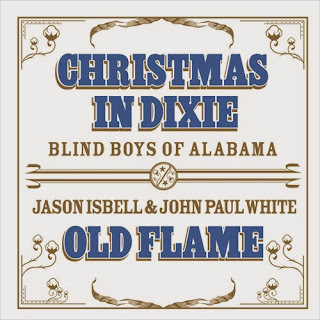 It was retitled to 'Have Yourself a Blessed Little Christmas' and has been recorded by several gospel artists since then. The version that Frank Sinatra recorded for the single release in 1963 also had the new 1957 lyrics. 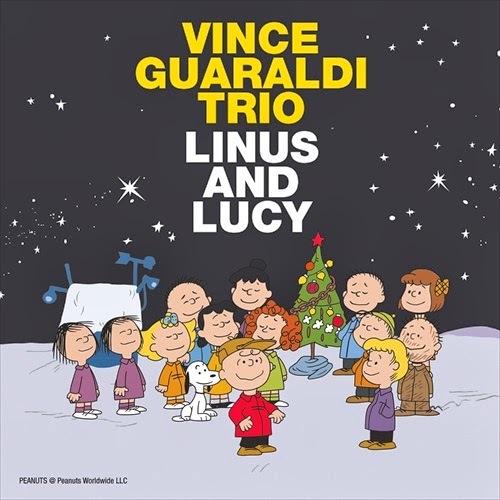 There are still artists who prefer the Judy Garland version to the more cheery 1957-version, as it acknowledges that Christmas is not all about being cheerful and jolly, but that it is also a time you miss beloved ones, and a time that gives hope in difficult times. It is exactly this feeling that the Judy Garland-version expresses very well. Besides on the 1963 UK single, that same year, the song also appeared on two more Frank Sinatra 7” records. 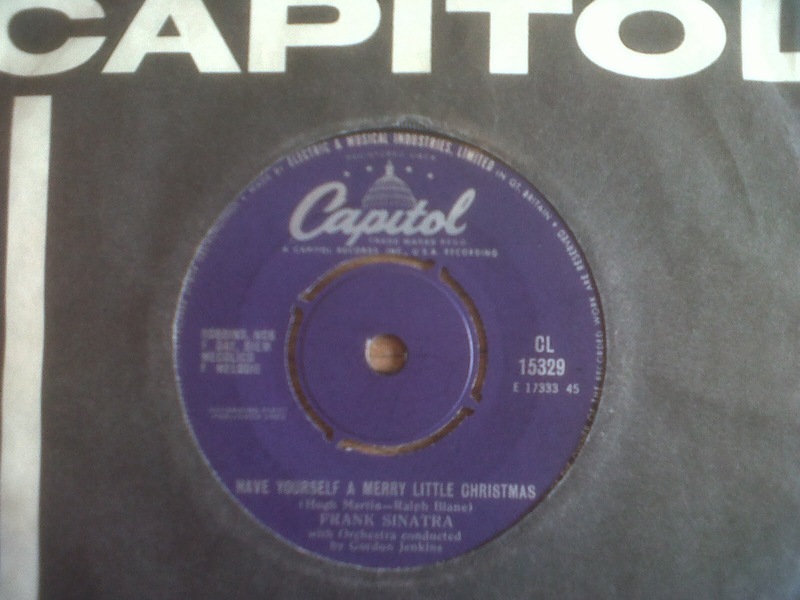 Also in the UK, 'Have Yourself A Merry Little Christmas' appeared on a EP with the same title, that also featured tracks by Sammy Davis Jr, Keely Smith and Dean Martin on Reprise Records. The song also appeared on a split 7” between Frank Sinatra and Les Baxter's Balladeers, who did a Christmas Medley on the B-side, also on Reprise Records. Other Frank Sinatra 7”'s, that include the song, is a Columbia Records EP (EP 10321), that included three more Christmas classics: 'Santa Claus Is Coming To Town', 'White Christmas' and 'Jingle Bells' on Columbia Records (EP 10321). And in 1976, Reprise Records released a Frank Sinatra EP in the UK, titled 'Christmas Mem'ries, with 'Have Yourself A Merry Little Christmas as first track on side B. 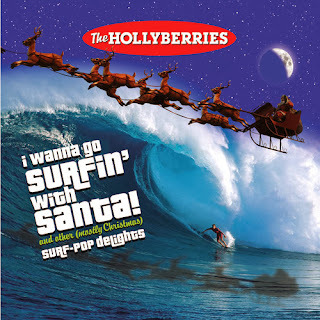 Other tracks included 'Christmas Mem'ries', 'A Baby Just Like You' and 'Whatever Happened To Christmas'. 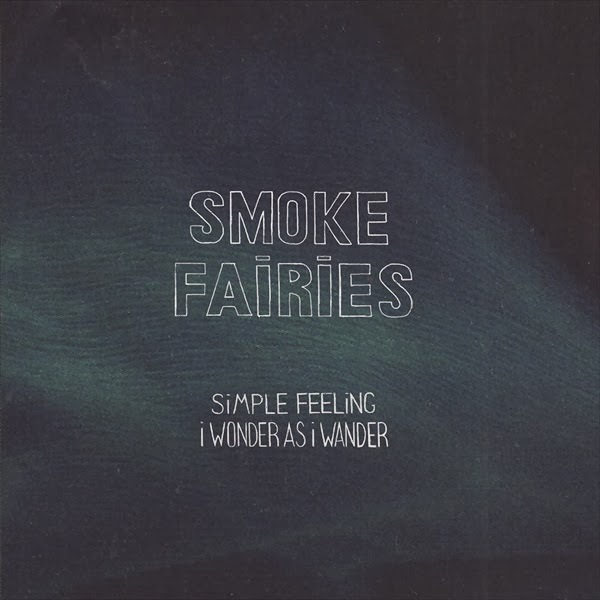 The song has been recorded by many other artists, also on 7”. 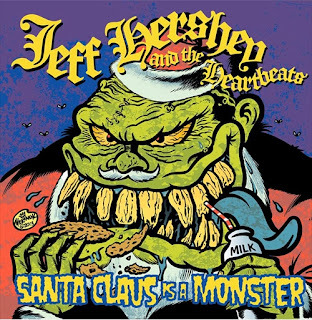 The song got more and more popular with time, making it one of the most covered non-traditional Christmas songs now. 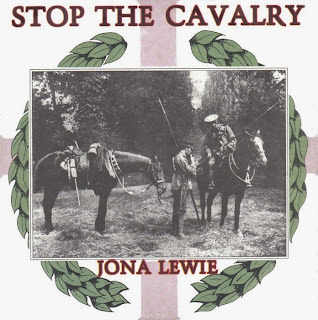 EP's that included the song were recorded by The Michael Sammes Singers (1958), The Singing Nolans (1972), John Denver And The Muppets (1979) and David Grant & Jaki Graham (1985). 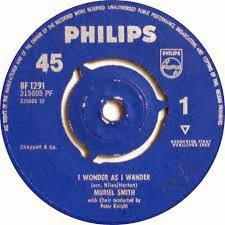 On 7” the song appeared as A-side on singles by Margaret Whiting (1949), Ramsey Lewis (1958), The Hollyridge Strings (1965), Andy Williams (1966), Barbra Streisand (1967), David Grant & Jaki Graham (1985), Crystal Gayle (1986) and Fear (2011, as RSD Black Friday release). As B-side it appeared on singles by Cliff Richard (a promo with A-side 'Mistletoe And Wine'), Sascha Burland And The Skipjack Choir (1963), Andy Williams (1965) and Carnie And Wendy Wilson (1993). This list is probably far from complete. On the B-side of the 1963 UK single, there is another Frank Sinatra Christmas classic, 'I'll Be Home For Christmas', a beautiful ballad-kind-of-song, with 'whoowhoo'-female back up vocals, also present on the A-side, that give it both songs a comforting, relaxing and a real Christmas-y feel. 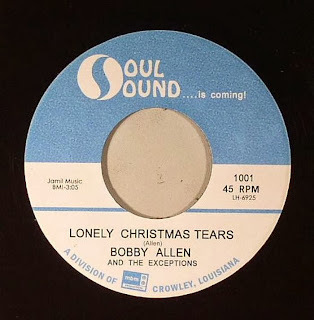 Funny thing is that I was planning to post this today, and when I was visting Concerto Records yesterday (to bring them a new bunch of Snowflakes Christmas singles), guess what I found there: exactly this single, that I did not have in my collection yet – I like these coincidences! 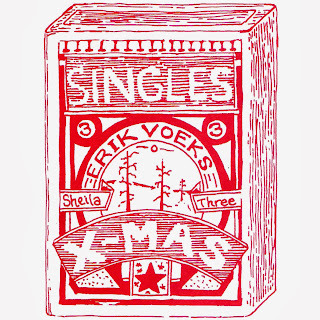 Snowflakes Christmas Singles celebrates the Christmas single in two ways. By the Singles Club, aimed at releasing new and hopefully soon to be classic Christmas singles. 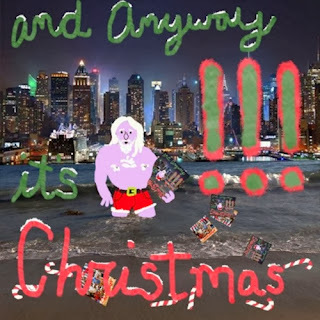 And by documenting the Christmas singles from the past, especially those that deserve to be heard, also in 2013. 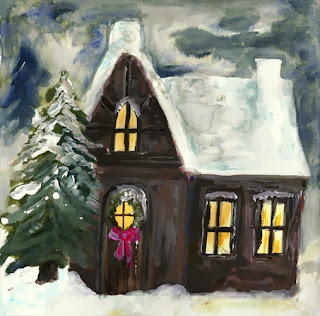 The first Christmas single that I like to write about, features my favorite Christmas song, the beautiful 'The Secret Of Christmas', sung by Ella Fitzgerald. Ella Fitzgerald doesn't really need any introduction, as she was one of the biggest, if not the biggest, jazz singer of the 20th Century. 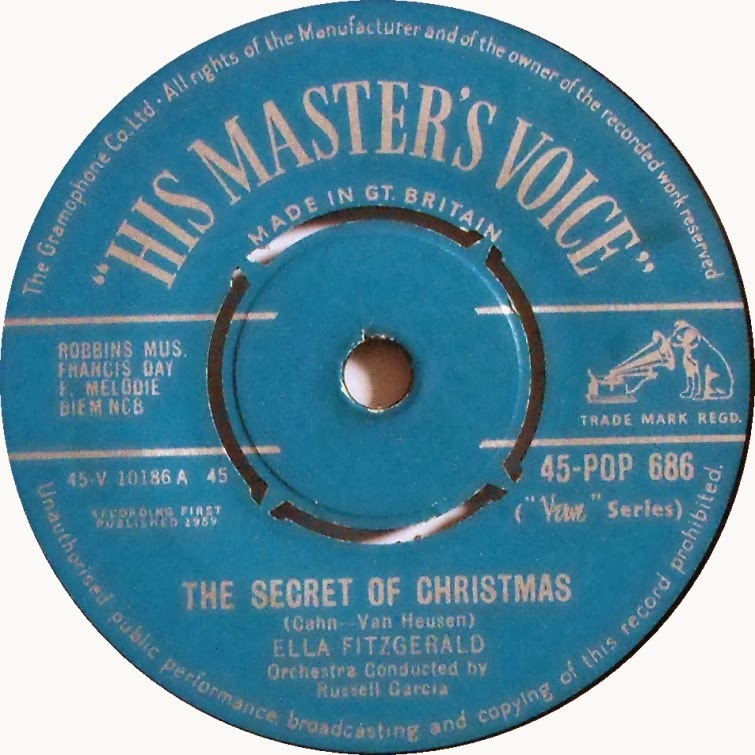 As every famous jazz singer Ella has recorded a range of Christmas songs. Probably most famous is her 1960 Verve Christmas album “Ella Wishes You A Swinging Christmas”, including such standards as 'Let It Snow! Let It Snow! Let It Snow! 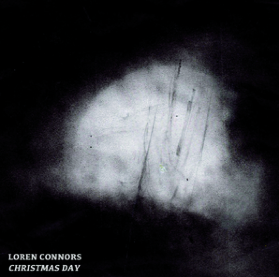 ', 'Sleigh Ride' and 'Winter Wonderland'. The year before the album was released, Ella had recorded two other Christmas songs for Verve. On 3 september 1959, Ella entered United Records, in Hollywood, Los Angeles, CA and cut three tracks, arranged by Russ Garcia, and accompanied by his Orchestra. Besides swing standard 'Beat Me Daddy, Eight To The Bar' (later B-side to Ella's single 'Like Young'), Ella recorded two Christmas songs: 'The Christmas Song', written by Mel Tormé and Robert Wells and a more recent song, 'The Secret Of Christmas'. 'The Secret Of Christmas' was written by Sammy Cahn and Jimmy Van Heusen for Bing Crosby and was first performed by him in the 1959 20th Century Fox movie 'Say One For Me'. Bing Crosby recorded the song with an arrangement by Frank DeVol for a single that year released by Columbia Records. 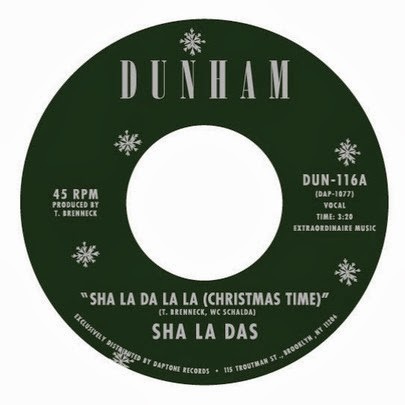 It interesting that Frank DeVol would also arrange Ella's Verve Christmas album the following year, but did not arrange Ella's version of 'The Secret Of Christmas'. 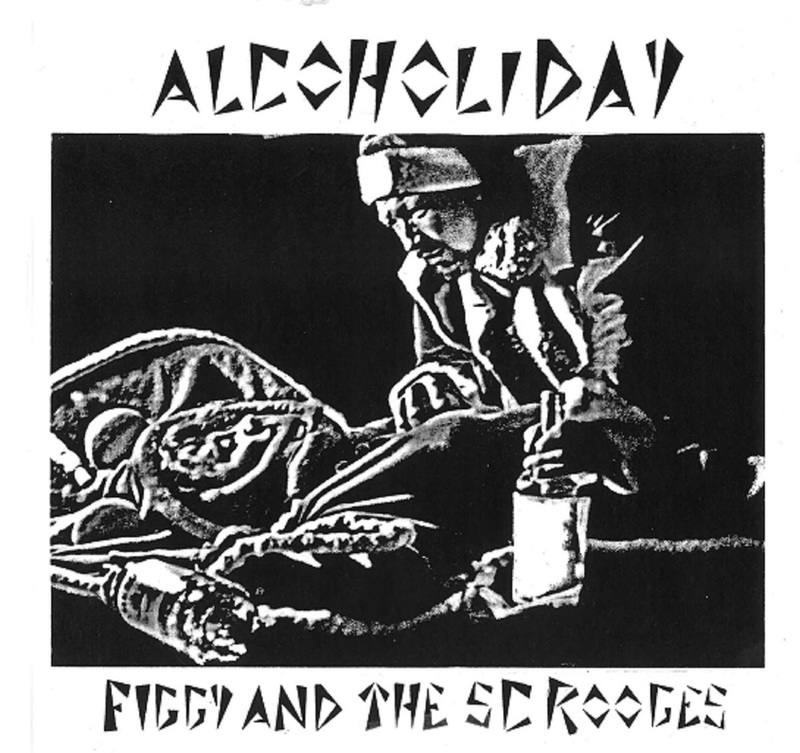 Bing Crosby did record a second version of the song, in 1964, for the album 'The 12 Songs Of Christmas'. In the United States, 'The Secret Of Christmas' was released as the B-side to 'The Christmas Song', as Verve V 10186. 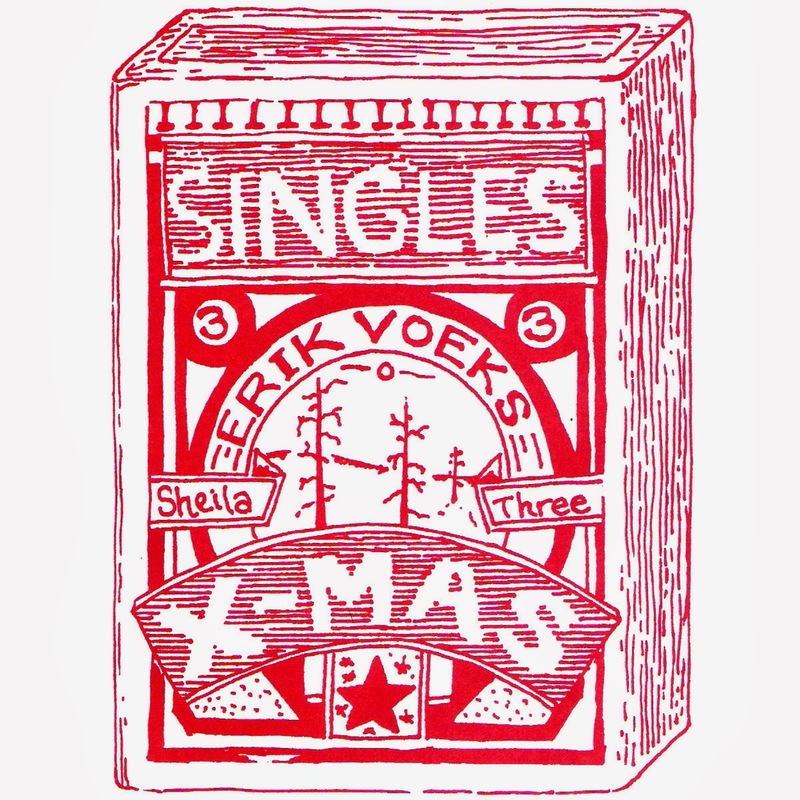 Also in other countries, like The Netherlands, 'The Christmas Song' was the A-side of the single (Verve VV 20.079X45). The British valued the beauty of 'The Secret Of Christmas', as Ella's UK label, His Master Voice, released the two songs on 7” (as 45 POP 686) and choose to make 'The Secret Of Christmas' the A-side of the single. 'The Secret Of Christmas' is a very simple song, without any couplets or refrain. The song is 2.45 minutes long, but listening to it, it is as if is even shorter. It starts out very quietly with Ella's voice and very minimal musical accompanement, and sums up all that Christmas isn't – “not the glow you feel, when snow appears”, “not the Christmas cards you've send for years”, “not the joyful sound when sleighbells ring or the merry songs children sing”. Slowy some bells and violins are turning up in the sound. When the song reaches its conclusion, the secret of Christmas is revealed: “it is not the things you do at Christmas time, but the Christmas things you do, all year through”. And is there really a better way to describe the spirit of Christmas? For the completists, the recordings featured, besides Ella Fitzgerald on vocals, Russ Garcia (arr, cnd) and his orchestra, consisting of Pete Candoli, Philip Candreva, Buddy Childers, Stu Williamson (tp), Murray McEachern, George Roberts, Lloyd Ulyate (tb), Jay Corre, Chuck Gentry, Bill Holman, Ted Nash (ww), Mary Jane Barton (hp), David Frisina, Dan Lube, William Miller, Eudice Shapiro, Felix Slatkin (vl), Claude JR. Williamson (p), Herb Ellis (g), Red Mitchell (b), Tommy Shepard (eb) and Jack Sperling (d). 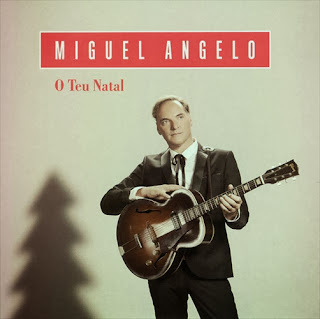 Unfortunately, the single did not chart, neither in the USA with 'The Christmas Song' as the A-side, nor in the UK, with 'The Secret Of Christmas' as the A-side.